These additional configurations support along with support for CloudLink SecureVM makes Azure Backup an enterprise-grade backup solution to reliably backup virtual machines running in Azure. For enterprises moving their critical VMs and data to Azure both encryption and backup are top requirements. Azure Backup and CloudLink SecureVM help enterprises seamlessly achieve both requirements. The entire encryption of data happens transparently in the VM layer. When Azure Backup does a snapshot of the VM’s disks and transfers data, it accesses and transfers only the encrypted data. On restore, the data in the page blobs continues to be encrypted and upon restored VM SecureVM agent connects to the server at boot time to authenticate the keys . 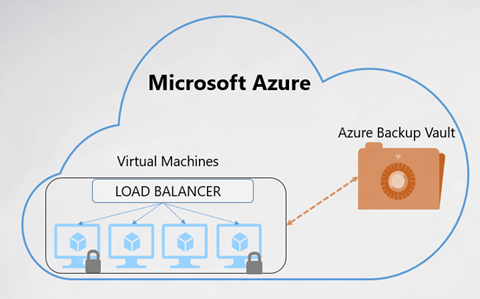 Discover the virtual machines that need to be protected using Azure Backup in Backup vault. Register the discovered virtual machines to Backup vault. Protect the registered virtual machines by associating them with a policy that defines a backup schedule and retention time for the backup copies. Virtual machines protected in Azure Backup vault can be restored using UI or PowerShell. We recommend using a new cloud service option while restoring the virtual machine from UI. Using PowerShell, you can restore the virtual machine disks from backup vault. These restored disks can be attached to the desired VM configuration created using PowerShell cmdlets. To get started with Azure Backup, all you need is an Azure subscription. Once you have Azure subscription, you can create Azure Backup vault for free. Learn how to backup IaaS virtual machines in five minutes. Looking for documentation? Check out Azure IaaS VM backup documentation. Need help? Reach out in the Azure Backup forum for support. Tell us how we can improve Azure Backup by contributing new ideas and up-voting existing ones.